NOUBA baked Duo mat and pearly eyeshadow for a sophisticated result ! The Duo combinations range from striking colors to classic, subtle, and very adaptable pearly shades. The two colours widen your look possibilities. Use one colour, combine the two or even layer them. The matte shadows blend beautifully to create the most luxurious silky contour, while the frosted hues give eyes a wet-looking, metallic sheen. Achieve multiple looks from a single color: applied dry, the shadows appear softer and more transparent, but with a wet brush, they become opaque and intense. As a general rule, apply the darkest shades close to the lash line and the outer half of the eye. Work on both eyes simultaneously for a more symmetrical application. Fashion and innovation are characteristic of DOUBLE BUBBLE formulation. Double colour eyeshadows with a texture soft as silk. A deep pure colour that makes the look more intriguing for an exciting and charismatic woman. Intense, sparkling and radiant eyes, charming with reflexing effects created by a perfect light harmony. To focus the eyes for a look full of magnetic depth. 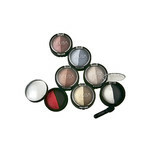 You can find online at www.bransus.eu a wide assortment of NOUBA Duo eyeshadows. The products can be ordered via our webshop and normally delivered within one working day. View our wide range of eyeshadows and order easily online.